Karl Blind participated in the uprising in the Grand Duchy of Baden led by Friedrich Hecker, and had to flee. The next year, he joined the band of liberals headed by Gustav Struve which invaded southern Germany. He was taken prisoner and sentenced to eight years' confinement, but after eight months in prison, he was freed by a revolutionary mob and began to lead an unsteady life throughout Europe. 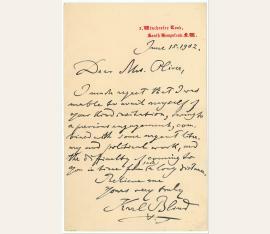 Blind maintained an active correspondence with other democratic leaders and like-minded personages such as Karl Marx, Giuseppe Garibaldi, Giuseppe Mazzini, and Louis Blanc. 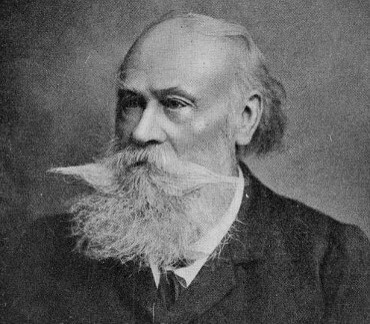 Revolutionär und Publizist (1826-1907). "Czarism At Bay". 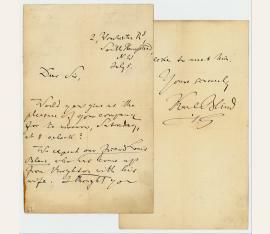 Autograph manuscript signed twice (in title and at end). O. O. 60 SS. auf 60 Bll. Gr.-8vo. 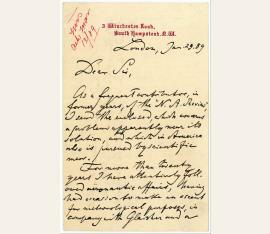 The complete text (setting copy) of his long essay on current political events in Russia, written shortly before the Revolution of 1905: "As the forces of [Russian despotism; stricken out and corrected to:] Czardom are driven back and crippled more and more, both on sea and on land, curious attempts are being made in England to impress public opinion with the idea that, if [inserted: ever] she were [stricken out: to] actively to turn against Russia, she would have to reckon with an armed alliance between Russia and Germany [...]". With numerous revisions in ink and pencil as well as setting instructions ("all minion on this page" etc. ); a few leaves assembled from paragraphs clipped from other sheets and glued together. Occasional edge flaws, but very well preserved. - Even as a law student in Heidelberg, the Mannheim-born Blind promoted a political revolution that would produce a unified, democratic German republic; after a brief imprisonment he participated in the failed Baden insurrection of 1848 led by Friedrich Hecker and Gustav Struve. 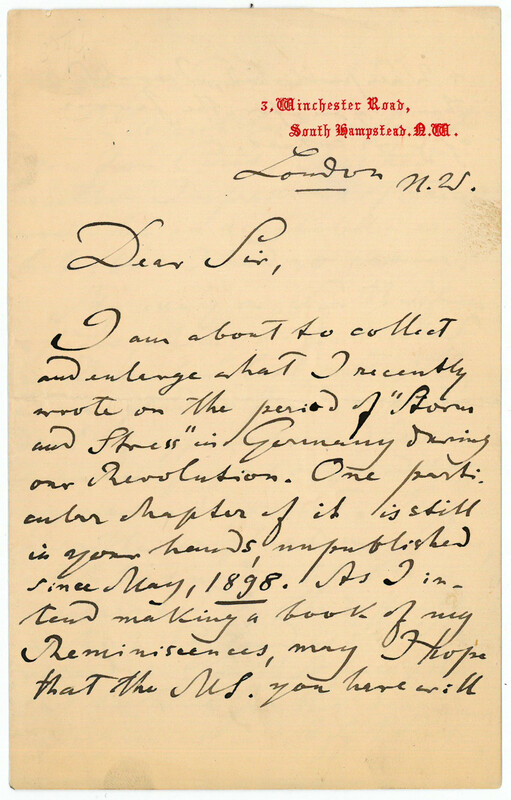 Blind first met Marx at the Karlsruhe Republican Committee in May 1848, where Marx and Engels declared their frustration with the course of the uprising. As Engels remembered, the 21-year-old Blind was one of only two members of the committee who had supported their opinion. Indeed, Blind was taken prisoner and sentenced to eight years’ confinement, but was soon freed by fellow revolutionaries and escaped to France, and later to England. 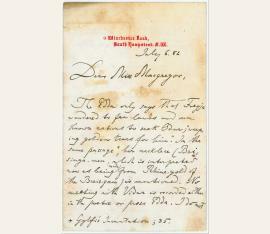 During Marx’s early weeks of refuge in London he even lodged with Blind: in a letter to Freiligrath written on 5 September 1849, he gives Blind’s address as his own. Blind permanently settled in London in 1852 and continued to advance the cause of democracy as a writer. He was well-connected among European republicans and corresponded with Garibaldi, Kossuth, and Louis Blanc. A man of wide education and interests, Blind composed not only political propaganda and journalism but also biography and works on history and mythology, as well as on German and Indian literature..
Revolutionär und Publizist (1826-1907). Autograph letter signed. St Leonards-on-Sea. 1½ SS. auf Doppelblatt. Kl.-8vo. To an unnamed addressee, confirming the receipt of £ 28/18/10. German revolutionist and writer (1826-1907). 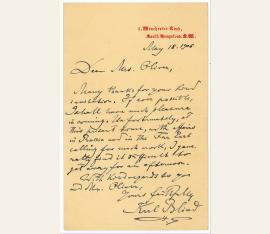 Autograph letter signed. [London]. 8vo. 1 p. on bifolium. 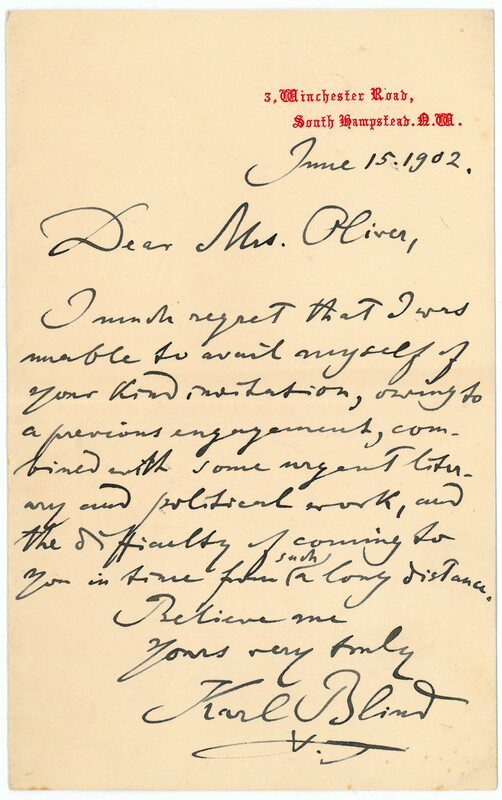 To Mrs. Oliver, regretting that his literary and political work prevents his accepting her invitation: "I much regret that I was unable to avail myself of your kind invitation, owing to a previous engagement, combined with some urgent literary and political work, and the difficulty of coming to you in time from such a long distance [...]". - On stationery with printed address. 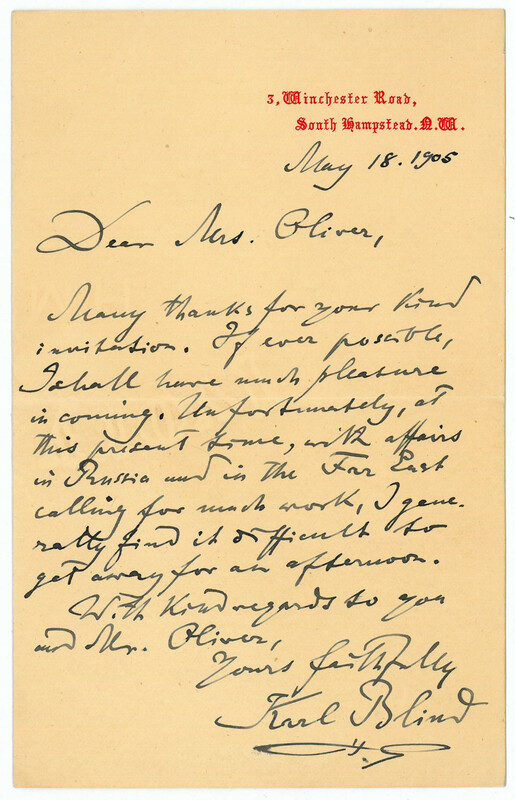 To Mrs. Oliver: "Many thanks for your kind invitation. If ever possible, I shall have much pleasure in coming. Unfortunately, at this present time, with affairs in Russia and in the Far East calling for much work, I generally find it difficult to get away for an afternoon [...]". - On stationery with printed address. German revolutionist and writer (1826-1907). Autograph letter signed. [London]. 8vo. 3 pp. on bifolium. 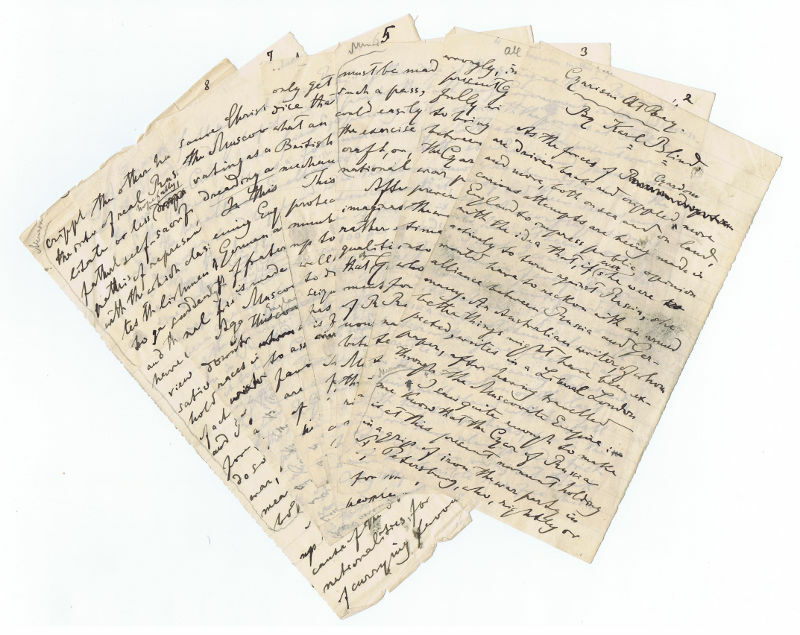 To Miss E. Eva Boult, citing his views as set forth in an issue of The Antiquary: "On the eve of our leaving town for a short time, your letter reaches me. Please excuse, therefore, this hurried answer. 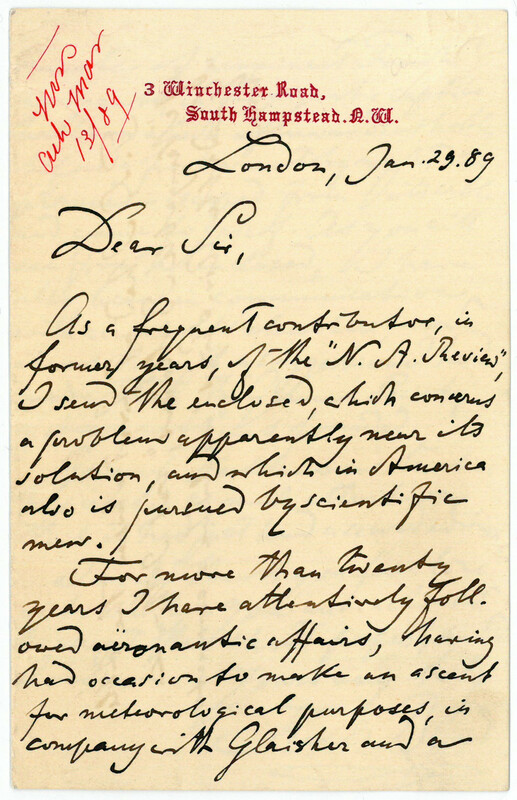 The question at issue more intimately concerns Prof. Sayce [i. e. the pioneer British Assyriologist and linguist Archibald Sayce] from whom I have quoted. As far as my own views are involved in it, you will find them indicated both in the April number of The Antiquary (p. 145, 1st col.), and in the May number (p.
p. 201 and 202). What we now have of the 'Homeric' poems, are comparatively such late productions that we cannot wonder at finding in them, especially as regards art, descriptions of a rather anachronistic kind. The Phoenikians, consequently, may have been worked into the earlier rhapsodic ballads at a later date. A comparison between the Eddic Nibelung lays and our national Epic will make this procedure very clear. The story of the fall of Troy is, no doubt, an exceedingly old one [...]". 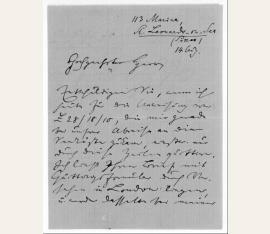 - On stationery with printed address..
German revolutionist and writer (1826-1907). Autograph letter signed. [London]. 8vo. 2½ pp. on bifolium. To Miss Macgregor, citing the Edda and at some length a point regarding Freyja and vidar: "The Edda only says that Freyja wandered to far lands and unknown nations to seek Odur, 'weeping golden tears for him'. In the same passage Gylfi's incantation, 35, her necklace (Brisinga-men, which is interpreted now as being made from Rhine-gold of the Breis-gau) is mentioned. No meeting with Vidar is recorded either in the poetic or prose Edda. I do not remember a tale of this kind [...]". - On stationery with printed address. - Very spotty and some damage to lower corner of fol. 2 (not touching text). To Miss Macgregor, returning her poem on Freyja. Comments on another Germanic mythological cycle and on the origin of Freyja: "I return with thanks your poem on Freyja's Roaming Guest for Odur, which I have read with much pleasure. I think Aurora, belonging to another cycle of mythology, should be replaced by Dawn. The East being, in Germanic love, the quarter where life awakes, as typified by the goddess Ostara, would perhaps better be called the 'glowing', instead of the 'slumb[e]rous' [...]". - On stationery with printed address. - Quite spotty and some damage to upper corner of fol. 2 (slightly touching text). German revolutionist and writer (1826-1907). 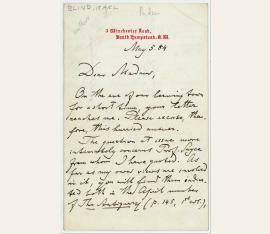 Autograph letter signed. [London]. 8vo. 1½ pp. on bifolium. 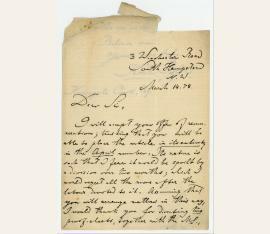 To Keningale Cook, accepting remuneration and dicussing the placement of his article in subsequent issues: "I will accept your offer of remuneration; trusting that you will be able to place the article in its entirety in the April number. 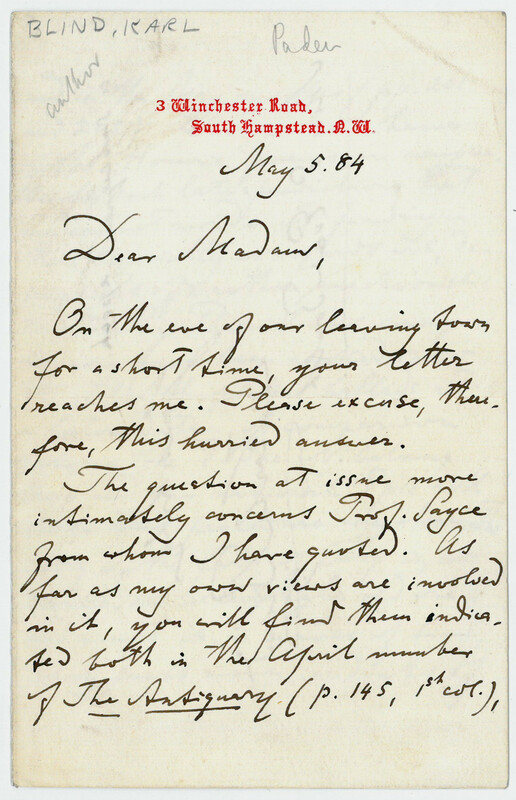 Its nature is such that I fear it would be spoilt by a division over two months; which I would regret all the more after the labour devoted to it [...]". - Strong damage to upper edge (small loss to text). German revolutionist and writer (1826-1907). 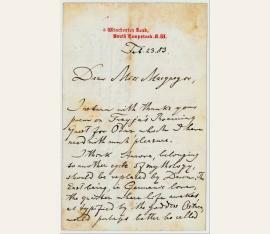 Autograph letter signed. No place or date. 8vo. 1 p. on bifolium. 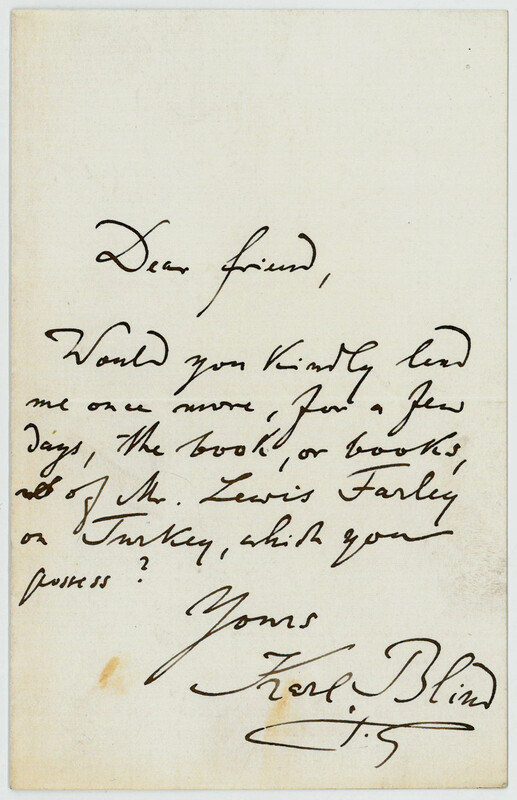 To an unnamed addressee: "Would you kindly lend me once more, for a few days, the book, or books, of Mr. Lewis Farley on Turkey, which you possess? [...]". - Slightly spotty. German revolutionist and writer (1826-1907). 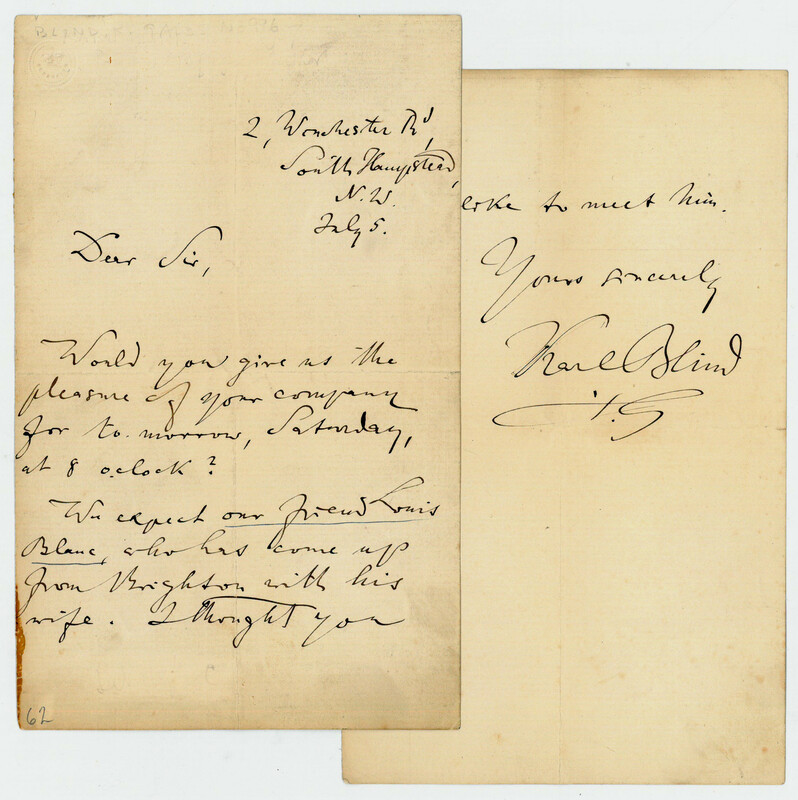 Autograph letter signed. No place. 8vo. 1½ pp. on bifolium. 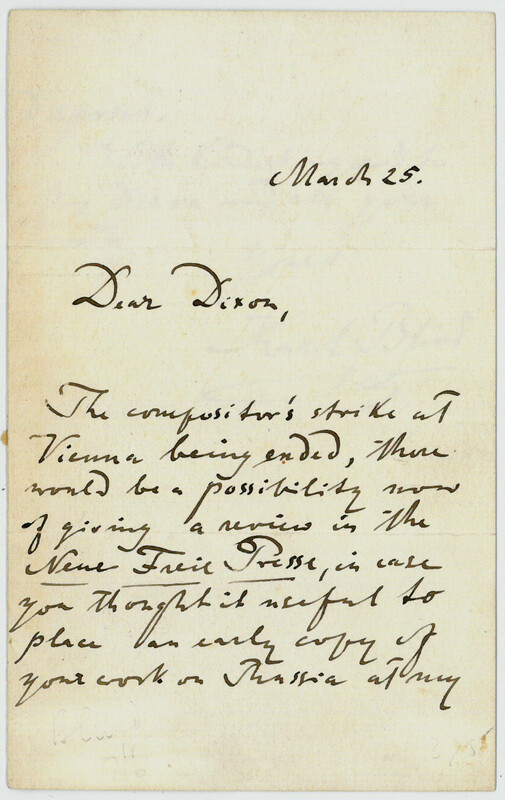 To Dixon: "The compositor's strike at Vienna being ended, there would be a possibility now of giving a review in the 'Neue Freie Presse', in case you thought it useful to place an early copy of your work on Russia at my disposal [...]". - Traces of old mounting on the reverse of fol. 2. German revolutionist and writer (1826-1907). 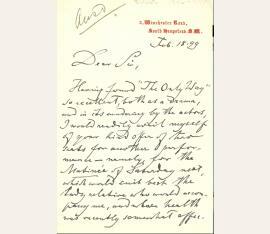 Autograph letter signed. [London]. 8vo. 1½ pp. on 2 ff. 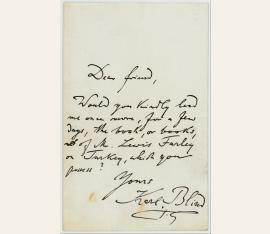 To an unnamed addressee: "Would you give us the pleasure of your company for tomorrow, Saturday, at 8 c clock? 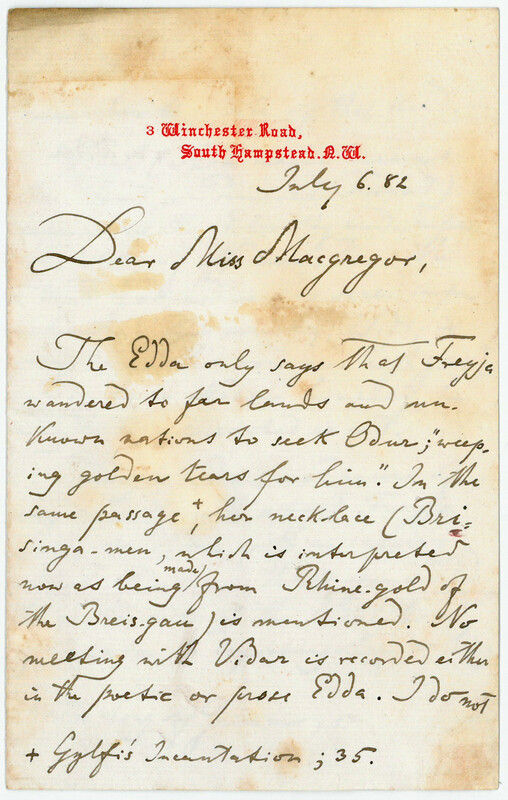 We expect our friend Louis Blanc, who has come up from Brighton with his wife [...]". - Somewhat dusty and spotty. German revolutionist and writer (1826-1907). 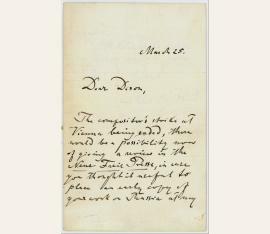 Autograph letter signed. [London]. 8vo. 3 pp. and 3 lines on bifolium. 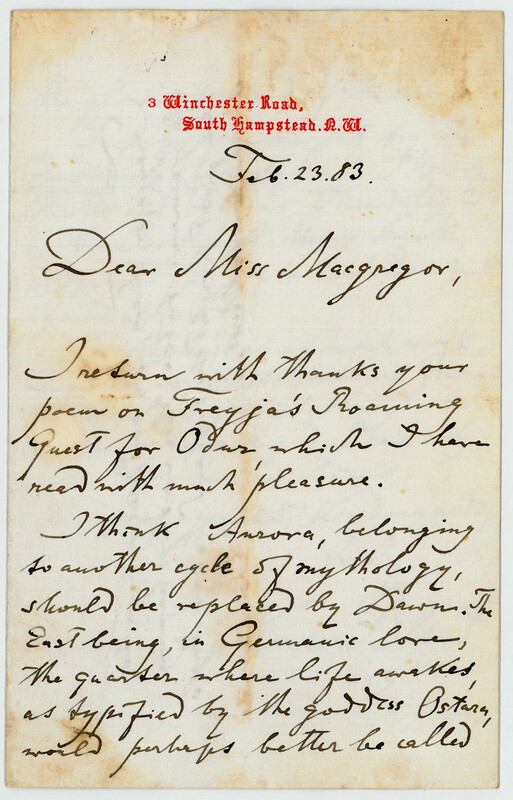 To his publisher, asking for the return of an unpublished chapter about the period of "Sturm und Drang" in Germany (to be incorporated in his forthcoming Reminiscences), with further discussion about England’s difficulties in South Africa and Afghanistan: "[...] At present, the terrible complication in China, which has no doubt been accelerated by the difficulties in which England is still involved in South Africa, threatens to have further dangerous consequences in Afghanistan, whose ruler is treated very unwisely by the Government at Simla. The tension between Simla and Kabul is very great. I hear a great deal about it through the former Chief State Secretary (Sultan Mohammed Khan, a gifted Indian by birth, whom I know intimately), who has been in England for some time, and who is on the point of going to Simla, and from there to Kabul. Would an article on China, Afghanistan, and the general situation - perhaps under the title 'New Storm Clouds' - be welcome? [...]". 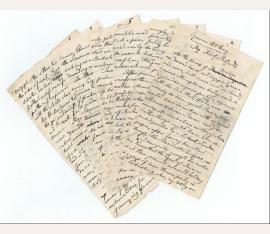 - On stationery with printed address..
German revolutionist and writer (1826-1907). Autograph letter signed. London. 8vo. 2½ pp. on bifolium. 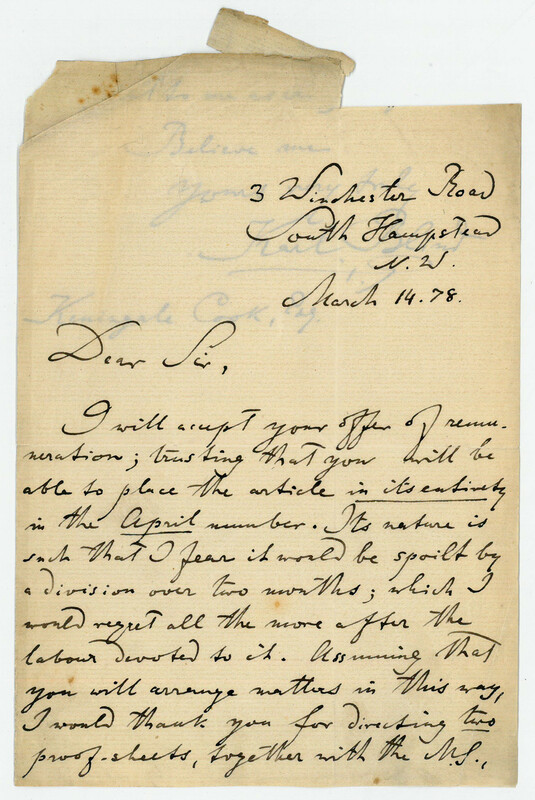 To the "North American Review" on sending an article concerning aviation: "[...] For more than twenty years I have attentively followed aeronautic affairs, having an occasion to make an ascent for meteorological purposes, in company with Glaisher and a number of prominent French aeronauts, in the gigantic captive balloon which afterwards [...] escaped from its cable and came to grief [...] and it was through a suggestion I have made that the 'German Society of Aeronauts' was founded [...] P. S. I had at first chosen the title of 'Navigable Balloons', but I think 'Guidable Air-Ships' would be a correcter term [...]". - On headed paper. 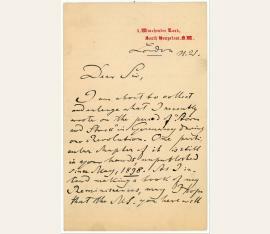 Karl Blind (1826-1907), Politiker, Schriftsteller. E. Brief m. U., Hampstead, 18. Februar 1899, 2 Seiten 8°. Doppelblatt. Mit gedruckter Adresse. Englisch. An Patrick E. Docherty, den er um Eintrittskarten für sich und eine Bekannte für das Stück „The Only Way“ bittet „Allow me to mention that, though my hearing is perfect, I found it, now and then, a little difficult to follow one ort wo actors at the seat (K 18) I occupied. I heard some remarks to the same effect from others. 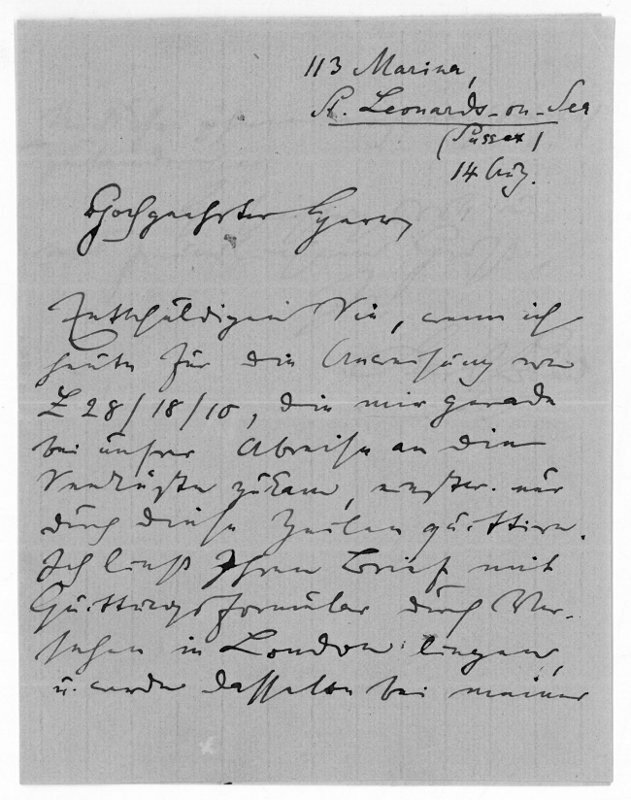 If it were possible to let me have Stall tickets a little more forward, you would confer an additional favour upon […]” – Blind studierte 1844-47 in Heidelberg Rechtswissenschaften, wurde wegen seiner offen geäußerten demokratischen Überzeugung zweimal der Univ. verwiesen und 1847 erstmals verhaftet. Als einer der Führer der republikanischen Linken in der badischen Revolution von 1848 floh er nach Straßburg, machte von der Schweiz aus den Einfall der Revolutionäre nach Baden mit, wurde gefangen genommen und in Rastatt zu fünf Jahren Einzel- und Kerkerhaft verurteilt. Nach der Mairevolution 1849 befreit, trat er als Herausgeber der „Karlsruher Zeitung“ in den Dienst des Landesausschusses, wurde Gesandter der badischen Revolutionsregierung in Paris; nach Belgien ausgewiesen, ging er ins Exil nach London. Dort veröffentlichte er neben politischen, historischen, germanistischen und literaturgeschichtlichen Studien die Bekenntnisse eines Achtundvierzigers (in: „Die Gegenwart“, 1882).